November 8, 2017 (El Cajon) - The 71st Annual Mother Goose Parade will be on November 19th, the Sunday before Thanksgiving. This year’s parade theme is “Family Traditions!” The parade begins at 1 p.m. You can see over 100 colorful and exciting parade entries, including floats, marching bands, clowns, equestrians, local dignitaries, TV celebrities, and Santa Claus! The parade Grand Marshal is Randy Jones, former San Diego Padre and CY Young award winner. October 25, 2017 (El Cajon) -- Waste Management of San Diego and the Mother Goose Parade Association announce launch of a non-perishable food drive benefiting the East County Transitional Living Center, which provides housing to help the homeless and others in need. The drive will run through November 15 with local businesses serving as drop off sites and will culminate with food being collected in Waste Management Bagster® bags at the Mother Goose Parade on Nov. 19. November 6, 2015 (El Cajon ) -- The annual Mother Goose Parade is nearly upon us, still going strong after nearly 70 years. This very popular event began in 1947 and some changes this year should breathe new life into this fantastic family attraction. This year, the parade shifts to a Saturday, Nov. 21st starting at 10 a.m.
November 4, 2014 (El Cajon)—The Mother Goose Parade in El Cajon will roll out at 12:15 p.m., later than in the past, along a new route on Sunday, November 23. 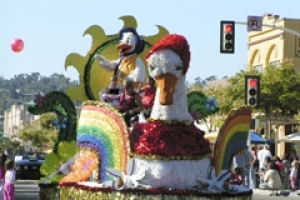 November 15, 2013 (El Cajon) – The 67th annual Mother Goose Parade will roll out at 10 a.m. on Sunday, November 24 complete with floats, marching bands, and radio personality Shotgun Tom Kelly as grand marshal. Mother Goose Village will also be set up at the Prescott Promenade, 201 East Main Street, with fun actiivites from 9 a.m. to 4 p.m. The parade, a cherished East County tradition that draws hundreds of thousands of spectators, begins at the corner of Main and Magnolia in downtown El Cajon, continuing eastbound to Second Street and East Main. November 21, 2012 (El Cajon) – ECM videographer Paul Kruze captured video highlights from the 2012 Mother Goose Parade, celebrating 100 years of El Cajon history in the city’s centennial year. This year’s parade featured fewer Hollywood celebrities than in the recent past, drawing on hometown heroes, Western equestrian groups, high school marching bands and a city centennial float for this once-in-a-century celebration. In keeping with tradition, the parade's finale featured Santa Claus and his reindeer-drawn sleigh, ushering in the start of the holiday season. November 11, 2011 (El Cajon) – The mother of all East County celebrations takes place November 20, when the 65th annual Mother Goose Parade rolls through downtown El Cajon. June 10, 2010 (El Cajon) -- The third annual "Royal Tea & Fashion Show" benefitting the 63rd Annual Mother Goose Parade will be held Saturday, June 12th, 11:00 a.m. to 2:00 p.m. at the Elks Lodge, 1400 East Washington Avenue in El Cajon. November 19, 2009 (El Cajon) – The 63rd annual Mother Goose Parade, East County’s most famous holiday tradition, will be held this Sunday, November 22nd. October 5, 2009 (El Cajon) – Brad Pitt, Angeline Jolie and Jennifer Anniston celebrity impersonators join a “Tribute to the Stars” fundraising event Oct. 10 at the El Cajon Performing Arts Center to benefit the Mother Goose Parade. Other special appearances include tribute artists for Gwen Stefani, the music of No Doubt, “Twilight” movie stars, and Johnny Depp tribute artist “Cap’n Jack” Sam Sparrow. The public is invited to join in the fun for $15 a person, $40 for a family four-pack--or splurge on a $45 rock star limo package that includes a celebrity red carpet welcome--complete with paparazzi to commemorate your arrival. IT’S OFFICIAL: MOTHER GOOSE PARADE IS SAVED! September 6, 2009 (El Cajon) – Organizers of the Mother Goose Parade have voted to save East County's most cherished holiday tradition, after an outpouring of community do nations raised enough to cover a significant portion of the costs, East County Magazine has learned. Read more about IT’S OFFICIAL: MOTHER GOOSE PARADE IS SAVED! August 10, 2009 (El Cajon) The historic Mother Goose Parade is in jeopardy of going dark this year--unless organizers can plump up their nest egg fast. June 16, 2009 (El Cajon)--The Mother Goose Parade is a long-standing holiday tradition in East County--and the largest parade of its kind west of the Mississippi River. 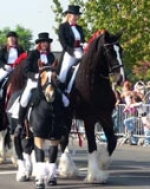 Floats, giant balloons, marching bands, equestrian entries and Santa Claus have long been part of the festivities. But this year, without public support the 63rd Annual Mother Goose Parade may not happen on November 22, 2009, if additional funding is not acquired.